So cool! I had not known about that either. Thank you! It would be fun to climb in one and roll down a hill. hey if any one sees one of these, you should spill some food coloring on it, grab a spoon and enjoy!!!! hey York Blog, what sacks of dust??? 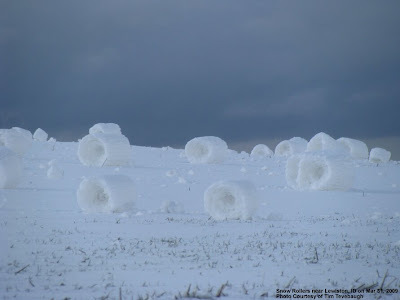 Those are pretty awesome snow formations :) They look like snow burritos. mccincol: Please write more 'Chronicles of Eris Mclane'. It's so awesome! It looks like a giant was playing in the snow. They are all so evenly placed and all the same direction almost like someone did it on purposes. I wish we got them at our house. Oh . . . Is that what those things were last winter? Holy StarClan, they shut down all the schools and everything because they thought the snow rollers were some kind of concealed threat. LOLLOLLOLLOLLOLLOL.